After the apparent flop of No Line on the Horizon (selling only 6 million copies of an album counts as a flop if you are U2), Bono and U2 were a little bit worried that they had lost their mojo somewhat so turned to Bellatron for inspiration and what followed was creative output to rival the famous Lennon McCartney partnership. 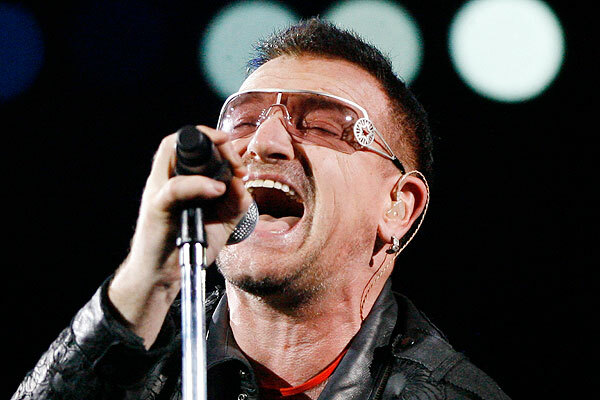 U2's new album, Cyber Love, features 12 tracks, 7 of which were penned by Bono and Bellatron together. The song 'If I was a Space Angel' will be the first single released. It also features Bellatron doing some backing vocals and playing some keyboards. Bono was interviewed by Rolling Stone and is quoted as saying "Yeah, we could have got on the Lady Gaga band wagon and write songs about Judas but we felt Bellatron has such sweet soul, she was the stellar trick we needed to get our groove back. Besides, she makes a mean gin martini". Long term fans of U2 are not sure of what to make the collaboration but anticipation is clearly high as itunes has already presold the single 300,000 times. Fans should relax as it was Bellatron who wrote the original songs for Stan Bush that were used in The Transformers Movie . U2 fans who buy the album on itunes prior to release will also get three b-sides free, one of which features Bellatron and Bono doing a duet of You Don't Bring Me Flowers . It was originally a hit for Barbara Streisand and Neil Diamond. Cyber Love is out April 29 on Jimmy Jangles Records who currently sponsor In A Far Away Galaxy.